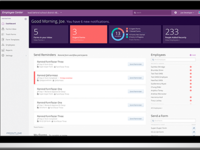 Frontline Absence & Time tracks employee absences, places substitutes and electronically captures actual time worked, allowing school districts to improve accountability and gain greater visibility into who is working in each building at any given time. 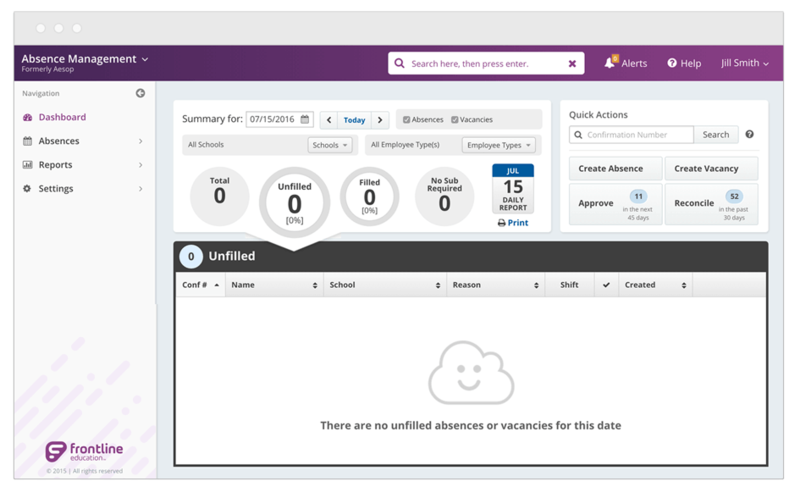 When teachers or other staff members need to take time off, Frontlines absence management tools ensure that a qualified substitute is ready to fill in. Frontline Absence & Time Reviews Recently Reviewed! Pros: It has been wonderful for not only myself but all of our teaching staff. Easy to use and the customer service has been great! If I can't get them by telephone, an email gets answered right away and our staff of approximately 150 teachers has all found it user friendly and simple to figure out. Cons: The only thing that I haven't liked about it is the structure of the day doesn't allow me to make small tweaks here and there when there are oddities. Like anything computer based, you have to follow the exact rules of how things are set up and when something odd comes up, it won't allow you to enter it other than the way it was originally set up. Overall: It took a load off of my plate as far as monitoring and keeping track of absences. It also generates reports at the end of the year so we can track how staff are using their absences, and if there is any abuse of it going on. Pros: With Frontline absence and time, I am able to integrate this system with other third party systems for payroll and human resources information. I can build my own reports and transfer them via FTP with any frequency I want-- I use this to post PTO time to our timecard system. Cons: Price is an issue. Frontline recently standardized their pricing based upon enrollment of our district. In the big picture, our licensing cost decreased but if we do change we are locked into our flat rate pricing. I am fortunate enough to have a strong data mining background, however I believe that other end users may have difficulty in creatign their own reporting or navigating around the system. Overall: I enjoy the Frontline suite of products. The systems do talk to each other but there can be improvements made. I have used the product for over 5 years. Pros: Frontline Absence and Time is integrated into Frontline's other products, making easier to transition between platforms such as Frontline Oasys or Frontline Professional Growth. It actually syncs from the Professional Growth side, so if someone submits a form to be out, and notes that it is during the workday, it will then schedule the absence in Absence and Time. This is a great added feature. There isn't much to the platform, so scheduling a day off and putting in notes or attaching documents is pretty easy. Cons: At times the syncing gets flustered. I think this is a platform issue. For example, if someone submits something in the Professional Growth side to attend a conference and be out during the workday, but then cancels the conference and decides not to attend, the Absence and Time side doesn't reflect the change. This has been an issue for us. We also have issue with teachers who are going to be out only during the morning or afternoon. Sometimes this causes headaches. Overall: Overall it has been effective. I am not blown away with the platform. As an end-user, it does what I need to schedule an absence or track my balances. The transition from SubFinder to Absence Management was smooth. The customer service has been good. Pros: I especially like the Learning Center for all the levels of users having access to the videos and articles to assist in navigating the system. The district had been on SubFinder for 15 years but we were able to transition employees and substitutes without a training session. They were directed to use the Learning Center after they received the ID and PIN. We do conduct trainings with the Campus Users but then have the ability to refer them to the Learning Center for assistance. Cons: I was not satisfied with the reports for ACA. They did not pull the same information as we could in SubFinder so we had to pull the information from our payroll system. Overall the reporting is an excellent tool. I have not had time to fully explore all that can be done with the reporting and the entire system. Overall: The ease of splitting multi-day jobs. Overall very user friendly. Has the ability to interface with our payroll system but we have not moved forward with that process yet. Frontline is leading the industry with innovative thinking and superior customer service. Pros: Ease of use. Once turned on, it basically runs itself! This system is great for all involved - administration, employees and substitutes, due to its flexibility. Cons: Inability to assign more than 1 employee type. Some employees work across 2 employee groups so they then need 2 pin #'s that are associated with 2 different employee types along with 2 different absence approvers and absence reasons. Overall: This software does so much work that I would not have time to do. Taking absence calls, searching for and assigning substitutes, tracking absence reason balances, processing absence forms, paying substitutes, creating and processing reports. Plus the data is correct and invaluable. Pros: There are so many pros to Frontline Absence Management. It doesn't matter if you are managing substitutes, a teacher or a substitute, each aspect of Frontline is easy to use. As an administrator, the reporting tools are the most useful. Seeing an overall picture of unfilled absences quickly to monthly time off reports for payroll. It's all easy to use and saves us a huge amount of time. Cons: There isn't anything I don't like about Frontline products. They are responsive to new ideas, customer services is great and it is so easy to use. Pros: the ability for subs and employees to access it anytime, anywhere. I also love my ability to access it as the navigator from various locations and devices. Customer service has also been a huge factor in why I recommend Frontline to other districts I talk to. Cons: The report writer is terrible. It has never met our needs when we try to create a customized report. I wish it could be updated and give us the ability to really customize the reports to our individual district needs. Cons: The only real issue I had was trying to add or delete districts to receive assignments from was virtually impossible from my phone, I would almost always have to get to my laptop to perform that task. Pros: I am currently a substitute teacher and this software makes it so easy to find available daily jobs. The software allows me to see a full monthly calendar and schedule work days, as well as keeps track of days that I have worked already. I am able to easily figure out how many days I worked on any given week, and can easily calculate what my paycheck will be. Great support. Very intuitive. Our fill rate has increased. Pros: To be able to toggle between screens. Ease of finding what I need quickly. The reporting feature is really superior. If there is no canned report that will work for finding what I need then I can create my own. And if I still have something I need I can call support and they are right there to hook me up. Cons: The way it looks. Needs some sprucing up with color and size of formatting. Checking boxes for configurations are tiny "chickletts" sized boxes. If you have to add a lot to a new sub you need ninja like skills to go quickly. Overall: Higher fill rates. Simplicity for all employees and substitutes. I use Frontline daily for a substitute teacher management system. I use the app and the web program. Pros: I like that that it is very user friendly. The buttons and fonts are easy to read and it is easy to edit details once you've created an absence. I also like that you can add notes that can be read by the sub, the teacher, the administrator, or all of the above. Cons: I have not found anything that I dislike about the software in general, although it seems as if the software is frequently "down for maintenance" and cannot be accessed. Easy to use software for everyone evolved! Pros: How little maintenance is required. How easy it is for everyone to access. How user friendly the system is. Frees up a lot of administrative time and effort to find and place a sub. Cons: I do not like the downtime when a problem does arise, but Frontline is VERY fast in getting the issue resolved and notification out to all users. Overall: Was able to save money, free up resources, and have a fair system. Pros: Have used this product for several years and it works well. Cons: If you have a problem with working for multiple districts and one district blocks you out due to a part time position you took, you may encounter all districts blocking you out from getting jobs. Getting a customer service representative to talk to you is impossible. Overall: Usually have no problems. Pros: The best part of using Frontline Absence and Time is the convenience of being able to clock in and out of work as well as request time off from your phone, anywhere in the building versus having to wait at time clock station in office. Cons: The system often fails to log in, however with the latest updates it does not crash "as much". I've loved this software from the start. Overall: record keeping, keeping staff knowledgeable of their own balances, ownership of responsibilities by entering their own days. Substitutes are accountable. Pros: The customer support is above and beyond any other system I have used. Issues are resolved quickly and efficiently. The report writing feature is easy to use (you don't need much prior experience to learn this report writing system). Everyone I have spoken with is friendly and helpful and really seems to enjoy what they do. The system is highly customizable. Cons: There's really not much to dislike. However, lately the system has gone down more than I recall it going down in the past. One of our departments was unable to use AESOP because the employees in that department had shifts that crossed dates (EX: shift started 4:30PM and went through 12:30AM). Overall: It turned our substitute program around and improved our fill rate significantly. Could not live without Frontine Absence Management and Time and Attendance. Pros: The program works seamlessly with systems 3000. We are able to pull in attendance and sub data by simply running a report. Cons: I do not like the way the reports look. Lately chat sessions are taking way too long. This is very disappointing since it has been our main source for troubleshooting. Overall: The software does the work of at least two staff members. Pros: When you're sick at 5 am, AESOP makes it easy to let your school know you can't come in! I love that I can choose my own sub. Overall: Makes it very simple to let your admin know you're not going to be in. Pros: It is very user friendly and the support is unbelievable. I really like that we can pull information from Applicant Tracking to Absence Management. As Substitute Coordinator, I use this system daily. It make sub placement and maintenance a breeze! Pros: Not making personal phone calls, the system calls and places subs. Also love the report writing system and Campus User functionality. Cons: Customer Service has changed recently, and is disappointing. Response is OK...but not as superior as it once was. Overall: Major time saver in regard to daily substitute placement and reporting to DESE. Pros: THAT IS KEEPS UP WILL ALL OUR ABSENCES FOR US NO MORE STACKS AND STACKS OF PAPERS ON OUR DESK EACH MONTH FOR PAYROLL. Cons: THE WAIT TIMES FOR ONLINE HELP ARE BECOMING LONGER AND LONGER . AND THAT IS TAKING A LOT OF TIME UP FOR US. Overall: THIS SOFTWARE RELIEVED SO MUCH OF OUR ENDLESS PAPER MOVING FOR PEOPLE TAKING OFF. Easy to use and an awesome customer support staff! Pros: The customer service that comes with it. How easy it is to train new employees on how to use the software. Overall: Frees up time. Can do the calling faster and secure the substitutes faster. Pros: The reports that are available to track by employee, reason for absence, etc. That employees are responsible for entering their own time off. Cons: It used to be a lot easier to find substitute information (phone #'s, etc. ), but seems to be more difficult now. Pros: User friendly way to add substitute teachers for our school system. I love it. Cons: I sometimes have trouble getting in from home. 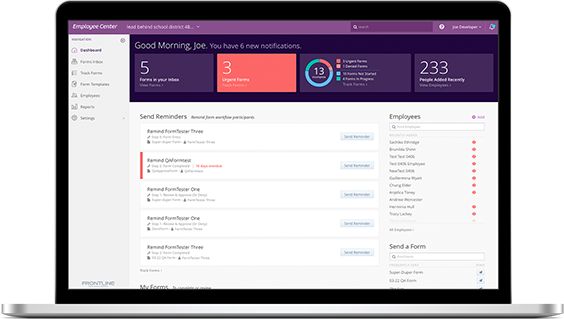 Overall: A faster and easier way to track employee absences. The reports are great and easy to read. No real training needed when trying to figure out system. The absence management side of the program is great. The time accounting piece is causing problems. Pros: Able to track absences and absence reasons on a daily basis. All school administrators know which employees are at work and those that are not. Cons: The time accounting piece is difficult to use when a classified employee may have 2-3 different jobs, with different pay scales, and different job sites. 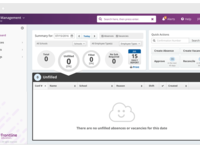 Overall: It is an excellent resource for tracking absences, obtaining substitutes, and time accounting although the time accounting piece is cumbersome. Pros: Frontline Absence and Time is a user friendly software for teachers that helps organize any absence that may arise. Cons: My one complaint about Frontline is that you have to have a district code when logging in on another device other than the device associated with your school district. As a teacher, I try not to bring my work home with me. Therefore, I don't bring my computer home. If I need an unexpected sub, I often struggle with remembering the school code to log in on my home device. However, that could just be my user error. Overall: Overall, I have had a good experience with Frontline. Pros: This software is very easy to use even when you are calling off in the middle of the night from your phone while your child is vomiting! It is also really nice to be able to check you balances of your days that you have used as well as what you still have left. But the best feature by far is being able to choose your top substitutes as well as the ones you do not want to use. This is definitely a teacher-friendly software. Cons: There are not any cons for the software that I can think of! Pros: Frees up a lot of time of making phone calls.!!! It is very user friendly. Subs can be linked to all district in the county so you know who is working when. Cons: I never know who to call for customer support there is just a help button but if you need something right away you can't get ahold of anyone. Pros: I like how all of my jobs are lined up in one place for substitute teaching and I can manage my preferences there as well. Cons: I do not like how there are times where I am not able to adjust working days. If I accept a long term assignment I can't choose days I am not available during that time. Pros: The software makes time and absence management simple and straightforward. The software has reporting features that make it easy to see things like who is consistently signing-in late. Cons: Some reports are difficult to find and require a bit of effort to find. As I substitute teacher, I use Absence management every day to hunt for jobs. Pros: I love that I am able to quickly scan available jobs by district, age group and subject area. The calendar feature is also handy because it allows me to see what jobs will be available in the future, schedule my own availability, and see where and when I worked previously. This becomes useful when estimating how much I'm going to get paid. Cons: There is not a lot I can say about this software that's negative, but here's one minor annoyance: I work in multiple districts and usually frontline is adept at managing all that for me, but there is one school district it keeps prompting me to "add," despite the fact that I've added it already. I can still see jobs in this district so it is more an annoyance than anything. Pros: The software is easy to use and a fairly efficient digital way to report sick and vacation absences. I'm in full-time employ and so it's usually a bit easier to report half- or full-day time off, but it does allow for hourly increments and even minute increments for hourly staff. Cons: I find it a bit odd that they utilize a "pin" instead of a password. It seems like it's something that could be easily hacked. Granted, there's a lot to steal besides reporting false absences, but there is some potential harm. There's also no concrete admin approval schedule - I haven't had any problems myself but it seems like there's the potential for approvals to get lost or ignored in the void of the internet. Again, no problems myself but I hear complaints from co-workers that they hadn't gotten approved yet. Overall: Despite the minor complaint about the pin number security, it's been a pretty good piece of software for employees to report absences. Pros: I have been teaching for over 7 years and have used Frontline for all of those years to find a sub. The system is completely easy to use. Absences are easy to create, subs are easy to assign or to just have the job posted. I can easily attach lesson plans for use as well. Cons: This software has been easy, I honestly have no issues with the program and plan to continue using it as long as the district does. Pros: I find this very easy to use - click on a date, create your absence and you are good to go. It is easy to search for past absences, days off, etc. Notifications are easy to see since it pops up as soon as you log in. Pros: From an instructors point of view, submitting time off requests are easy. For administration, request notifications are sent to designated contacts (e.g. attendance officer), providing reliable notification and documentation. Finding and requesting substitutes is also made easy through the software. Cons: From an instructor's perspective, the system for assigning / requesting subs is confusing. When requesting time off, you can "Save & Assign" a sub, which immediately places that individual as the substitute for the time off, or you can simpily "Save" which broadcasts the time off, allowing subs to pick up on a first-come first-serve basis. Would like to see a clearer way of presenting this, with an additional "Preferred" option, allowing instructors togive priority of requested time to only select preferred substitutes. Pros: With this program it is easy to find a favorite sub to request for the day and to attach lesson plans to the job so you do not have to go into work sick. It is also easy to put in for half days and easily select from the calendar what day you need off. Cons: The more custom options such as assigning a sub are more challenging at first and difficult to find but once you have used the tool for a while it becomes easier. Overall: This program is a definite time saver when putting in for a sub. Cons: Reload speed isn't great . Calling aspect isn't good either. Pros: I think it is a simple software to use to create an absence from work. I like that I can go in and identify my preferred subs so they have first chance to get the job. It is helpful that I can include an attachment in case I can't get into work to leave them there. I also like that I can view my current balances. Cons: I am still a little unclear about the preferred subs. I feel like the people I have blocked somehow are still able to view and pick up my jobs. Pros: I like that it will find subs for us and allow us to manage our time off campus. Cons: The restrictions central office has on the use of it. I know it's a local decision to use or not use parts. I wish we could do more. Overall: Teachers don't have to book their own subs. Having Frontline allows us to either book or own or have it find someone. Cons: I would like to be able to add more preferred subs. I think that would be helpful in making sure I get a sub I prefer. Pros: Our employer utilizes this software to manage employee call offs, scheduling time off, etc. Once employee data is entered by administrator, it is very easy for employees to use to schedule. Also very convenient to check balances. Waiting anxiously for app to become available. Overall: This software eliminates the need of administrators of keeping track of employee call offs. Pros: I like that I can schedule non work days so the system does not call me on those days. Cons: It is not very good at handling multiple districts. I work for three different districts and I will get phone calls from the other two districts even though I am working for the third. And when it crashes, it crashes! Overall: It will sometimes list jobs that are not actually available. If I had a choice, I would use another platform, but this is the platform all the school districts use. Pros: We couldn't be happier with our Absence Management System. The user interface is intuitive, and the customer service is excellent. Cons: I wouldn't change a thing. This is an excellent product and a good value for the money. We love Frontline! Overall: Increased efficiency, reduced labor cost, improved user experience. Pros: This software package makes absence management simple. The features that allow you to communicate with administrators and supervisors are top notch. Cons: Staff training was tedious, but overall it is still one of the best software programs available. Overall: Communication with substitutes is a great advantage. The ability to create an absence and have it fulfilled prior to the 6:30 am deadline makes finding a sub much easier. Competent for substitute management. Very poor for leave management. Pros: Contacts substitutes with opportunities. Allows staff to post substitute needs from home. Dependable access. Cons: Very inflexible configuration, particularly problem when used to interface with Payroll. Cost went up 25% in 2018 with no increase in functionality. No substantive improvements in product in 10 years we have been using it. Overall: It was fair for the cost and capability until Frontline drastically raised the prices. Pros: Making sure that you have coverage in your classroom can be very stressful. Frontline makes letting the district know that you will be out is easy. It even allows you to send in substitute plans if you are unable to get to the classroom. You can also send administrators a note. You can have a list of preferred substitutes as well. Indicating your reason for absence is also included. Cons: I haven't run into any problems. I would like to cite a problem, but I really haven't run into any. Overall: It has been a great overall experience. Easy to use and never have had issues with the web site not working or being down. Pros: I like how it keeps track of the total days I have missed and the balance I still have left to use. Pros: This is easy to use for teachers. I'm no spring chicken, but I can easily get lost in the tech world. I can easily navigate this to get things done on my end! Cons: The only con that I can think of is that it requires internet access to use. I have had days that my power gets knocked out and I can't access in order to use it. Pros: I like the ease of printing daily reports, and the functionality of the mobile app (seems to work well in multiple browsers). Cons: I wish it was easier to edit things like substitute report time, job performance ratings, and personal info. The software allows you to edit these fields, but you must 'dig' to find the editing pages.